The marketplace is changing faster than ever before, and competitive pressures continue to mount. To keep pace in this dynamic environment and to lay the foundation for growth, firms are realizing that their historical processes and on-premise systems are not adequate. 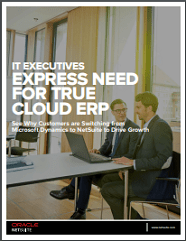 This white paper details what senior IT executives have to say on the importance of a cloud-based ERP system, and its importance with providing the visibility and scalability necessary for company growth.